We've put together this package especially for our friends with Day Cares or Preschools. The focus is on the little ones. First, you'll select one of our Water Tunnels or Slip n Slides. These are giant inflatable versions of the original slip n slide you remember from when you were a kid. The water rains down from above and the kiddos will love playing, splshing, slipping & sliding all day on it! 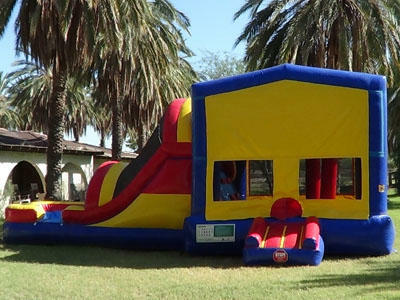 Next, we add one of our combination Bounce House & Water Slides. 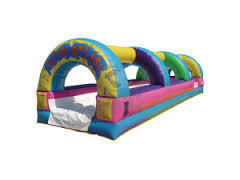 These inflatables have a standard size bounce area with a basketball hoop inside. There is a climbing wall leading to the top of the water slide. The Bounce/Slide Combo can be themed with any of over 40 different popular themes. You can pick one or leave it as a fun house. Your choice. 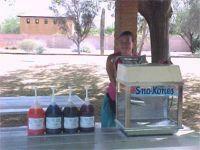 To top off your perfect Water Day we include a Snocone Machine for a extra treat. You can keep all of this up to 6 hours at the special rate of $395 (plus delivery). 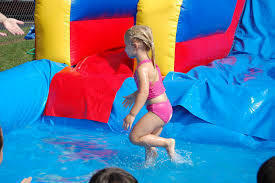 Tell us in the comment section of your online order which water tunnel/slip n slide and which theme you have selected.